The festive season is upon us! It is a time of reunion, happiness and bonding as families and loved ones come together to celebrate. However, all the get togethers and fun activities can result in a lot of wastage – a recent study has shown that food waste quantities usually rise 15-20% during festive periods in addition to the 23,000 tonnes of waste Malaysians generate daily (Less than 5% of this is recycled ). 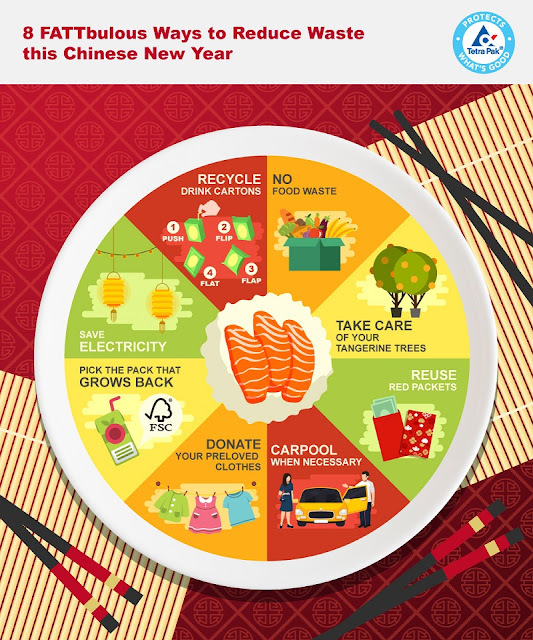 Do your bit to save the environment with these 8 FATTbulous ways to reduce waste this Chinese New Year! Did you know that the average Malaysian throws 1kg of food every day? Plan ahead and only buy what you need to avoid throwing out any extra. Shop at zero waste stores that minimise on packaging and bring your own reusable containers to do your bit in taking care of the environment! Show your tender, loving care towards the tangerine trees you purchase for the festive season so they can last all year round! Water them and make sure they get plenty of sunlight to last the rest of the year. Avoid using red packets that use a glue sealant, so the receiver is able to reuse them for the next round. Another useful tip is to use red packets that do not have zodiac signs on them so if you have extras, they can be used for the years to come. Cut down on your carbon footprint during your visitations by planning your transport strategically. Carpooling also allows more time for catching up and bonding! Do your clothes spark joy? If the answer is no, declutter your wardrobe to make space for new ones by donating your clothes that are still in good condition to charities or organisations that will benefit those in need. When buying packet drinks for your guests, choose those with the Forest Stewardship Council (FSC®) logo. This indicates that the materials come from responsibly managed forests – most of Tetra Pak® packaging in Malaysia has the FSC® stamp of approval, see if you can spot it when you shop! Lighting and decoration are a major part of the joyful reunions, so do remember to turn off your light switches when not in use to save electricity – and on your bills. Packet drinks are a staple in almost every house during Chinese New Year as they provide a refreshing relief from the heat. Recycle them after drinking by first pushing the straw completely inside the pack, then carry out the 3Fs – Flip, Flap and Flat. Then, drop them off at any of the recycle points throughout the country which you can find at http://recycle-easy.com.my/.